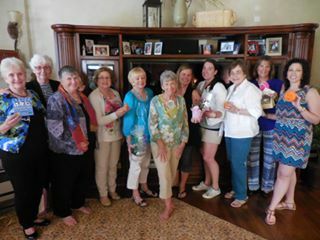 July, 2015 - Sigma Night Out Snow & Co.
Donna Embry Gardner, Nu, led discussion of A Thousand Splended Suns, by Khaled Hosseini. Seven Sigmas attended the WOY/Scholarship Brunch at Ritz Charles in Overland Park. 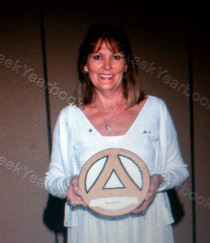 Congratulations to Brenda Riley Smith, Nu, was Sigma Sigma Sigma's Woman of the Year. 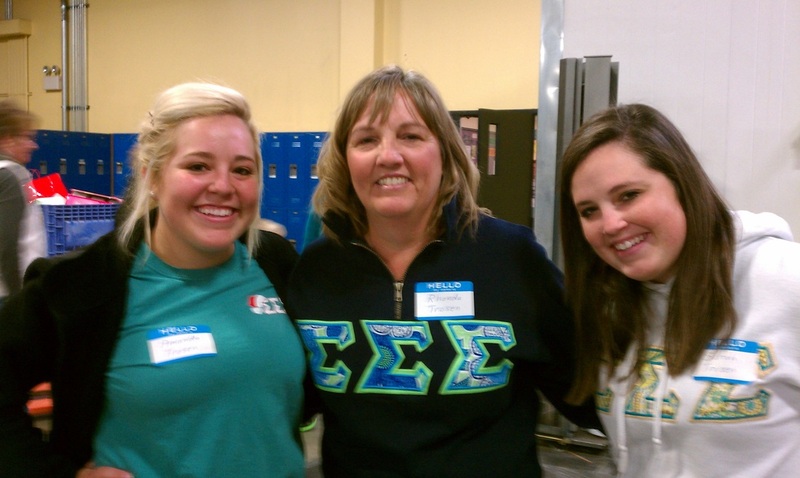 Congratulations to Patricia Smith, a Sigma at UCM, who was one of the scholarship recipients. Barbara Smith Thompson, Gail Ihrig lbauer, Brenda Riley Smith, Lucy Kirby Brewer, Ethel Neimeyer Blankenship and Melinda Dunard Horn , all from Nu chapter, contributed items for the silent auction. 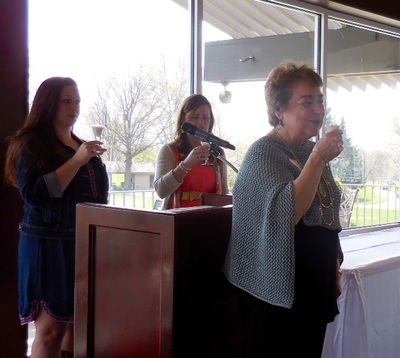 The auction raised over $4000 for the GKCPH scholarship fund. 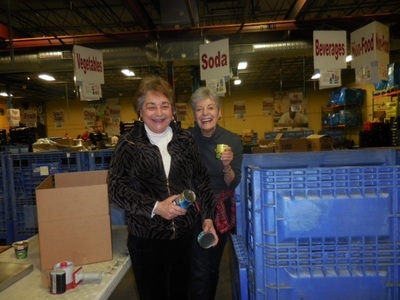 Vicki Wellman Bird, Nu, and Melinda Dunard Horn are our delegates to GKCPH. 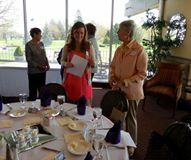 Alumnae from five collegiate chapters celebrated Founders' Day with a luncheon at Blue Hills Country Club. Lindsey Bauman and Erin Walton, both Chi, shared the duties of Mistress of Ceremonies. 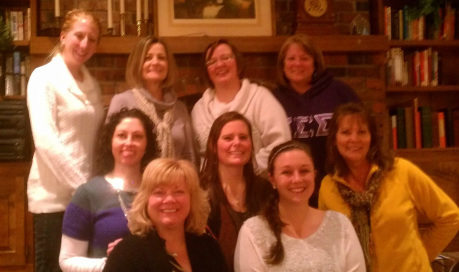 Liz Clark, Beta Beta; Godlove Velghe, Nu; Terry Stroble Jackson, Nu; Susan Sedge Brand, Nu; Cathy Angotti Althaus, Nu; Rosalie Cowdrey Karczewski, Nu; Katie Kanatzar, Chi. Our 4th year to volunteer at Harvesters--always a great time. 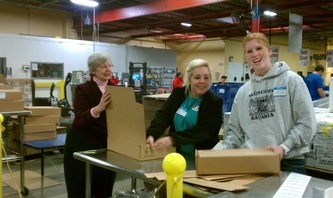 Three collegians from Eta Chi and two from MU came to work with the alums. 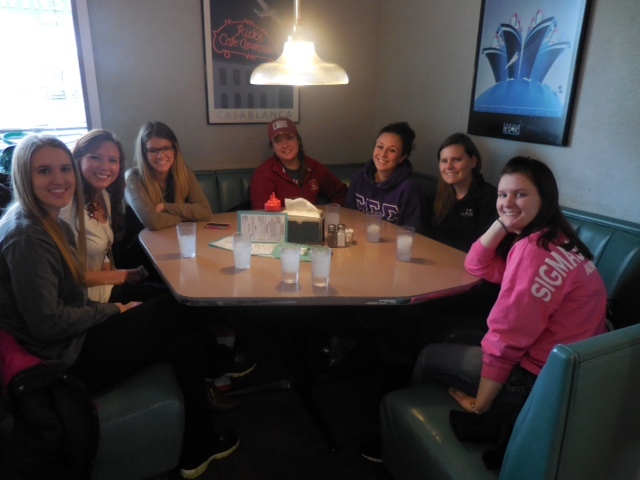 R1: Regan Morton, Eta Chi; Heather Parrie, Eta Chi; Carol Crank Phillips, Nu; Emma Hecht, Eta Chi; Kim Sage Benson, Mu; Sarah Trosen, Mu; Amanda Trosen, Mu. R2: Donna Jones Clark, Nu; Lindsey Reichert, Eta Chi; Spencer Wittmeyer, Mu; Shelby Wittmeyer, Mu; Sydney Wittmeyer Reusler, Mu; Kelli Ourada, Zeta Tau; Lindsey Baumann, Chi; Ashley Adorante, Alpha Gamma; Erin Walton, Chi; Katie Kanatzar, Chi; Carol Ruf Gurley, Nu; Rhonda Allen Trosen, Nu. Games, a craft and a cookie exchange--we had it all. First, we made a little Santa craft. 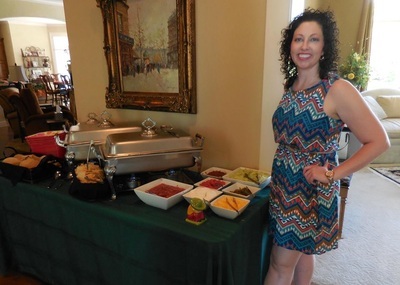 There was a contest for best sweater, best cookie, best reindeer antlers (see pictures in slide show). Kim, middle of 2nd row won the sweater contest. Emma's team won the antler contest. Brenda and Lucy tied on the Christmas art scene contest and Ashley knew the most about holiday movies. Not to be forgotten, we also ate cookies. It was a great Sigma week to get us ready for Christmas. 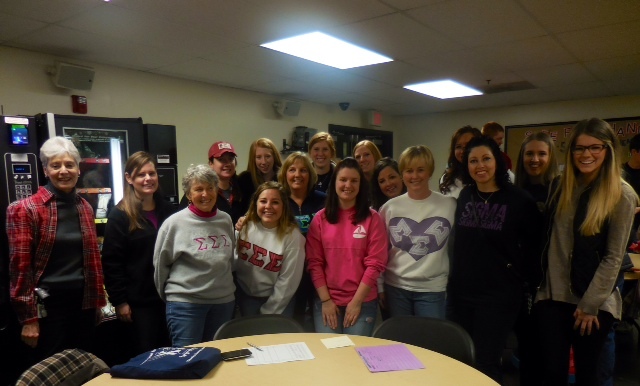 R3: Frankie Ritter Wainwright, Kappa; Cathy Angotti Althaus, Nu; Lindsey Baumann, Chi; Melinda Dunard Horn, Nu; Vicki Wellman Bird, Nu; Ashley Adorante, Alpha Gamma. Not pictured: Janis Edmon, Nu, and Rhonda Allen Trosen, Mu. $51.00 was collected for the Foundation and Cathy Althaus won the other half of the 50/50 drawing! 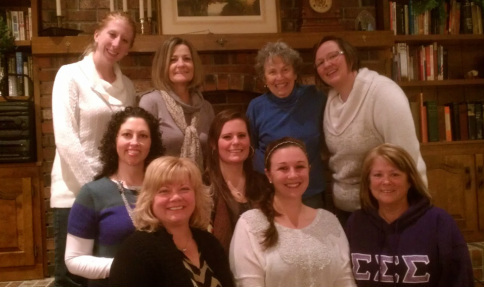 Top Row: Ashley Adorante, Alpha Gamma; Cathy Angotti Althaus, Nu; Carol Crank Phillips, Nu; Janis Edmon, Nu. Bottom Row: Lindsey Baumann, Chi; Katie Kanatzar, Chi; Kim Sage Benson, Mu; Erin Walton, Chi. 2014 Sigma Night Out at Snow & Co.
Lea Ann Rice Sprague, Nu; Lindsey Baumann, Chi; Ashley Adorante, Alpha Gamma; Janis Edmon, Nu; Emma Hecht, Eta Chi. Carol Crank Phillips, Nu; Kim Sage Benson, Mu; Sydney Wittmeyer Ruesler, Mu. 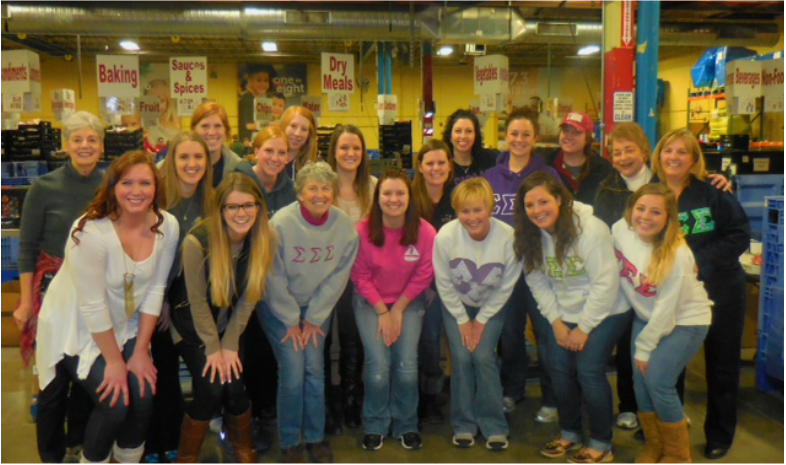 Collegians from Nu chapter joined alumnae to host the annual parties for the children at the Lee's Summit and Independence Hope Houses. 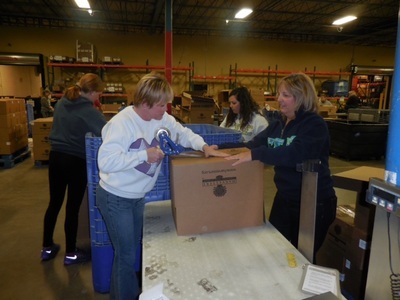 Barbara Smith Thompson, Nu, is chair of philanthropic activities. 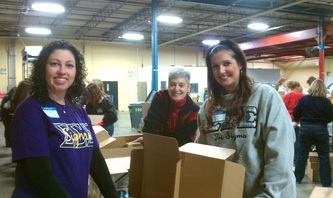 Carole Ruf Gurley, Nu, also helped in Independence. 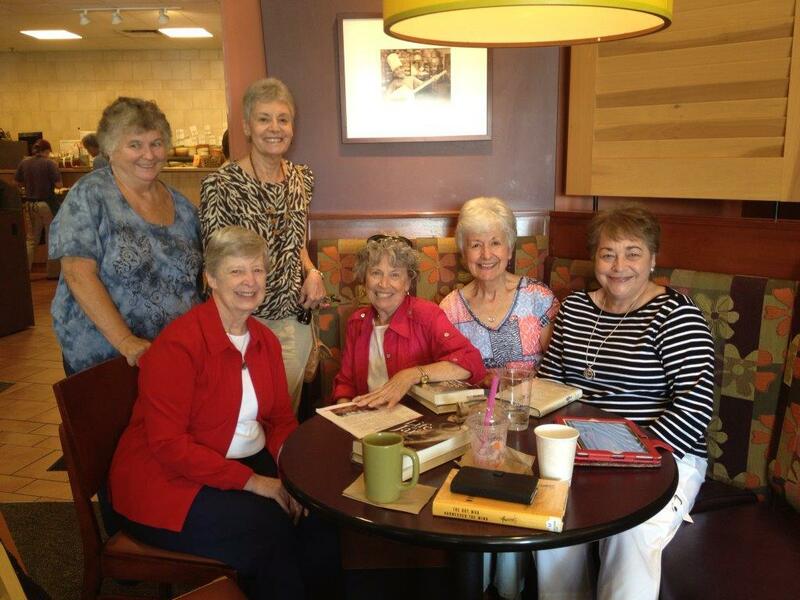 Thirteen Sigmas and one future Sigma met for coffee at the Independence Paneras. 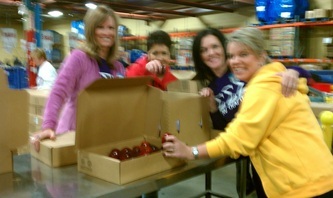 Carolyn Austin Granger, Nu, won the 50-50 drawing. 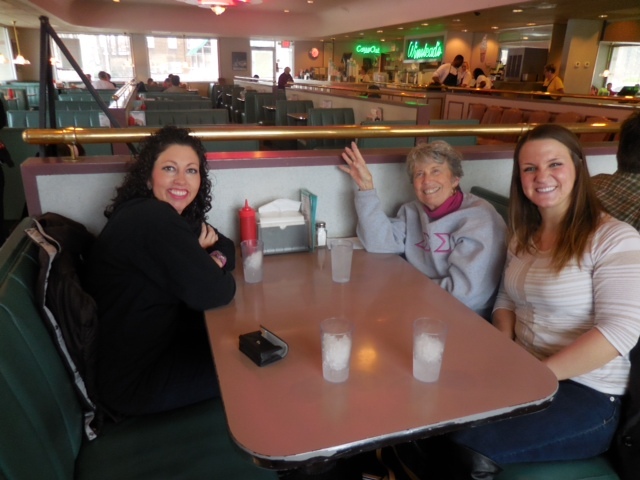 R1: Cathy Angotti Althaus, Nu, and her granddaughter; Lucy Kirby Brewer, Nu; Carol Crank Phillips, Nu; Carolyn Austin Granger, Nu. 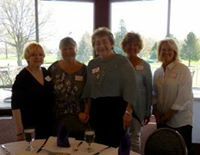 R2: Donna Jones Clark, Nu; Emma Hecht, Eta Chi; Melinda Dunard Horn, Nu; Barbara Smith Thompson, Nu; Pat Selover Arey, Nu; Brenda Porter Dumler, Nu; Sharon Heil Telgemeier, Nu; Carole Ruf Gurley, Nu. 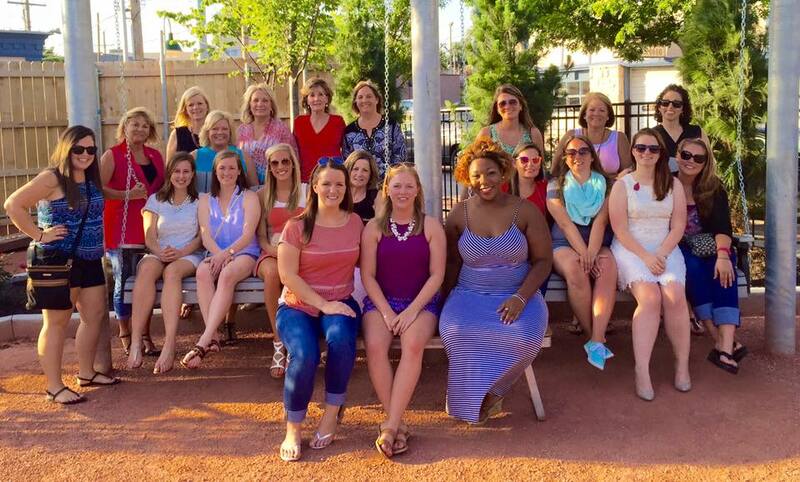 26 women gathered at the River Market Minsky's for a Sigma Social and Meeting. 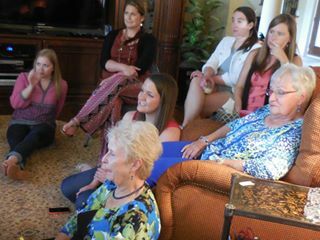 One 2014 grad and 5 new alums were welcomed. Ilene Burns won $43.50 in the 50/50 raffle. Two door prizes were also won. 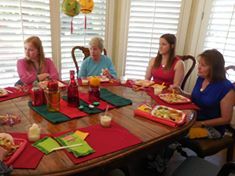 Lots of fun visiting & eating. 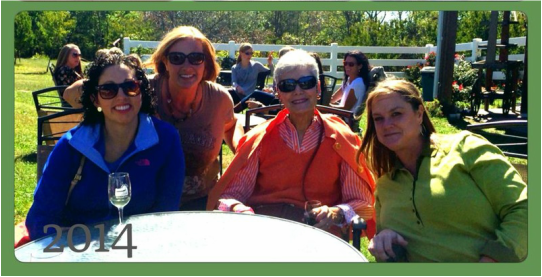 R1(Seated)-Ilene Ginardi Burns, Chi; Judy Roberts Ball, Chi; Carol Crank Phillips, Nu; Carole Ruf Gurley, Nu; Carolyn Granger Austin, Nu. 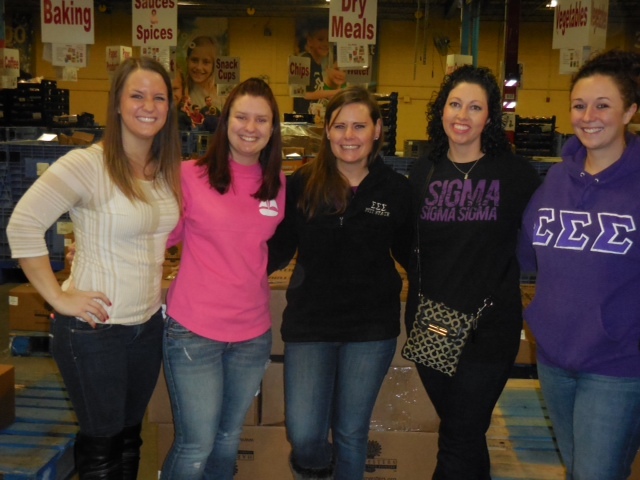 R2-Lindsey Baumann, Chi; Magen Reynolds, Mu; Amanda Ready, Zeta Tau; Leah Kunzler, Zeta Tau; Emma Hecht, Eta Chi; Shannon Colligan, Mu. 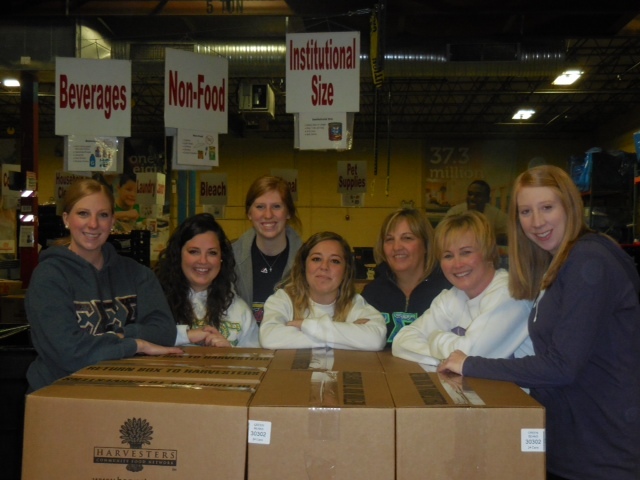 R3-Ashley Adorante, Alpha Gamma; Melissa McDonald, Chi; April Williams, Mu; Kelli Ourada, Zeta Tau; Shelby Wittemeyer, Mu; Liz Clark, Beta Beta. R4-Janis Edmon, Nu; Hannah Rosenwald, Pi; Cathy Angotti Althaus, Nu; Sam Meisenbacher, Mu; Vicki Wellman Bird, Nu; Donna Jones Clark, Nu; Melinda Dunard Horn, Nu. 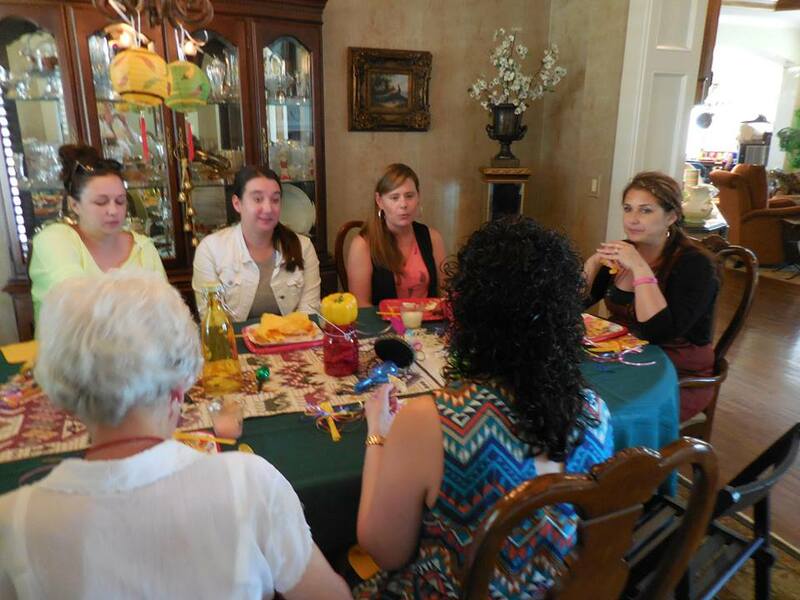 Andrea Martinez, Mu, far right in lower right picture. Not pictured, Lindsay Spiek, Zeta Tau. Eighteen Sigmas and guests attended the GKC Pan Hellenic WOY and Scholarship Brunch at the Ritz Charles on Saturday, April 26, 2014. 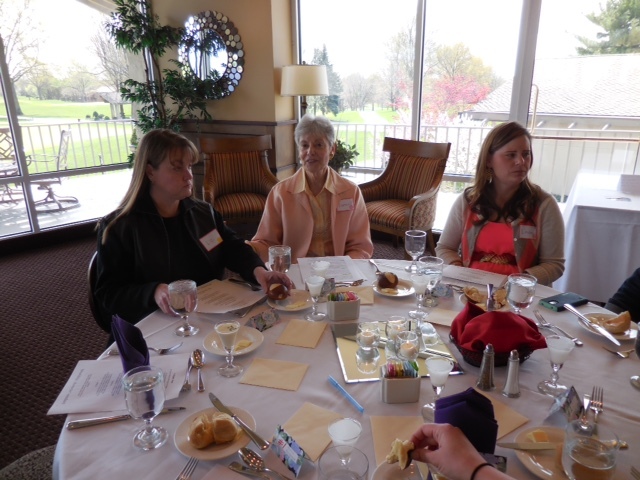 Dr. Barbara Smith Thompson, Nu, was our Woman of the Year and Leanna Meredith, Nu at UCM, received a GCKPH scholarship. 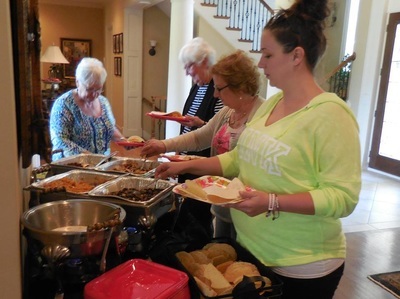 Twenty-six women enjoyed a catered lunch at the home of Carole Gurley to celebrate 116 years of Tri Sigma. 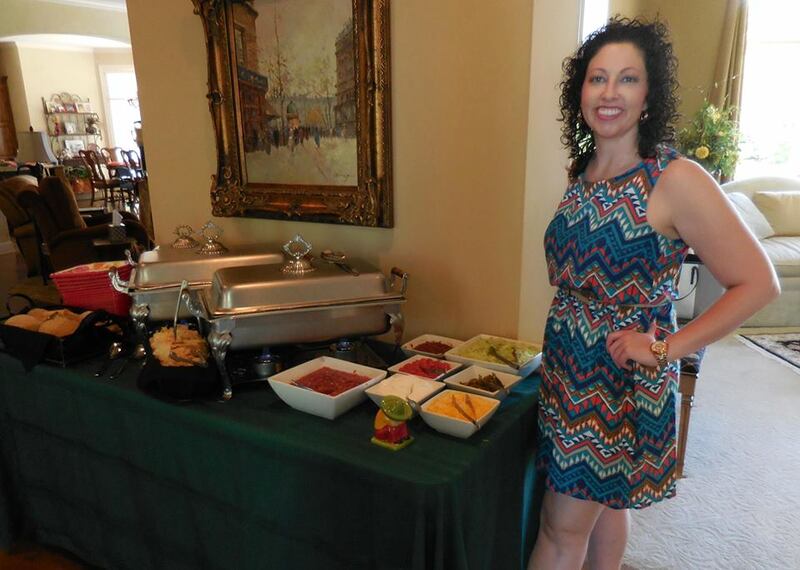 Old officers were thanked and new officers were welcomed. Lea Ann Rice Sprague, Nu, won $35 in the 50/50 drawing. The Founders' Day Program concluded with the singing of "Stately and Royal". 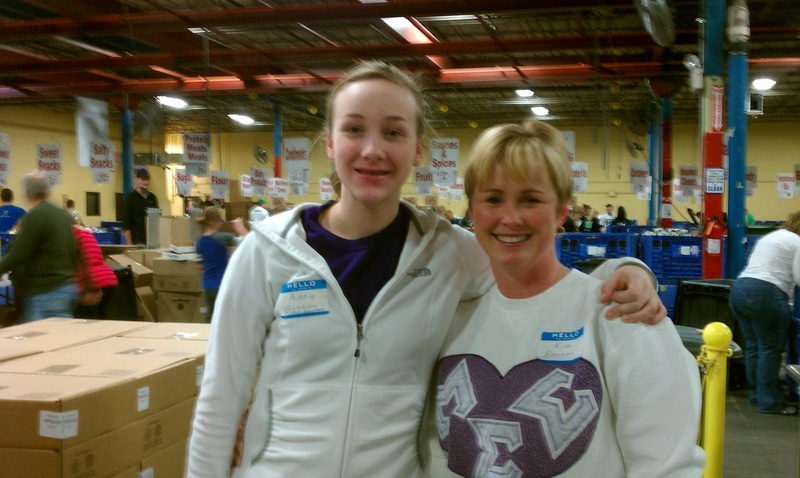 Left Photo: 1st row - Julie Shuck Doane, Nu; Erin Walton, Chi. 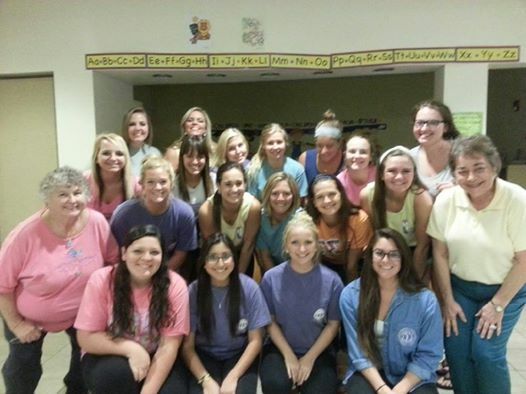 2nd row - Ashley Adorante, Alpha Gamma; Lindsey Baumann, Chi; Melinda Dunard Horn, Nu. 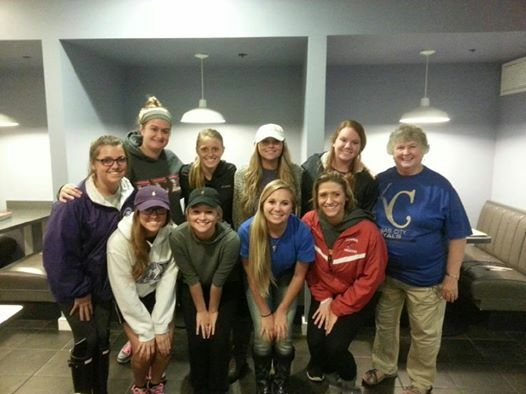 3rd row - Sydney Wittmeyer Ruesler, Mu; Lea Ann Rice Sprague, Nu; Lisa Fielder, Chi; Vicki Bird, Nu. 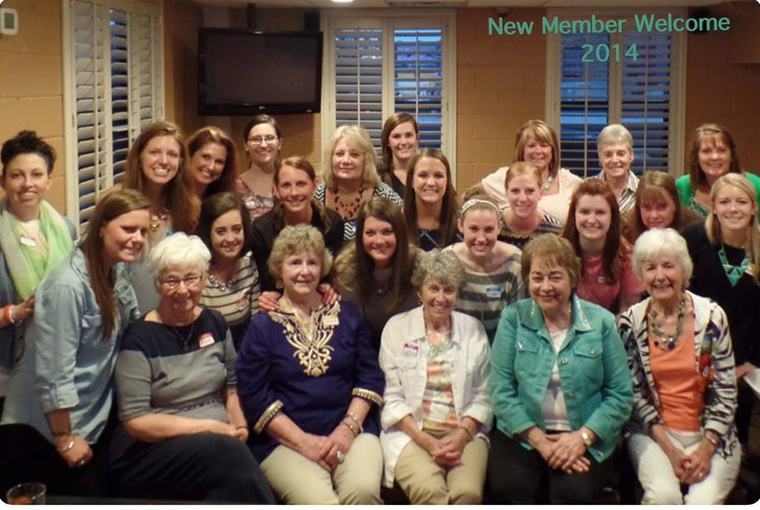 Right Photo: 3rd from left in 3rd row - Carol Crank Phillips, Nu. 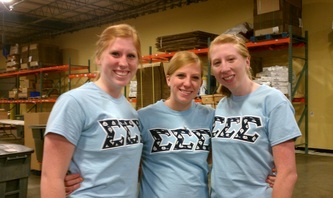 Not pictured, Lindsay Spiek, Zeta Tau. 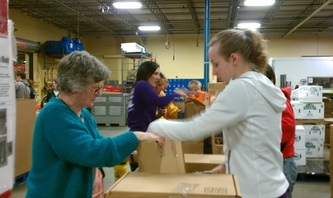 We collected many pairs of children's socks for Blair's Sock's Foundation, some sent by our Nu chapter collegians. Two more chances to bring new socks--the March coffee and April Founders' Day. 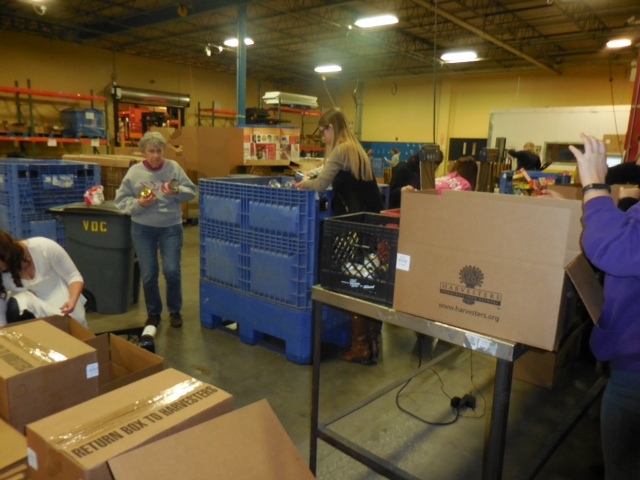 We sorted contributions into bins (see photos below). Above photo 1st row: Carolyn Granger Austin, Nu; Kelsey Porter, Mu collegian; Ashley Adorante, Alpha Gamma; Janis Edmon, Nu. 2nd row: Liz Clark, Beta Beta; Donna Jones Clark, Nu; Spencer Wittmeyer, Mu collegian; Sydney Wittmeyer Ruesler, Mu; Bri Smith, Mu; Carol Crank Phillips, Nu; Rosalie Cowdrey Karczewski, Nu; Shelby Wittmeyer, Mu. 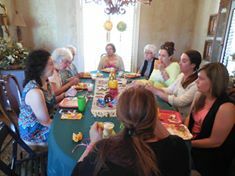 Wonderful brunch at the home of Frankie Ritter Wainwright, K. Lindsay Spiek and Ashley Adorante received the Circle Degree. Frankie's sister, Linda Ritter, K, from Ohio was a guest at the meeting. 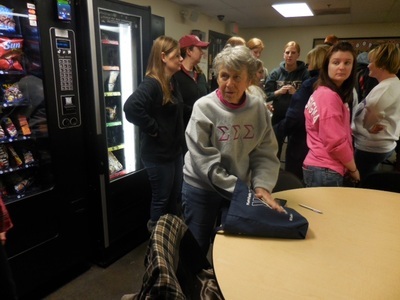 Carolyn Granger Austin won the 50-50 Drawing--$9 for Carolyn and $9 for the Sigma Foundation. We also got to see Frankie's new grandson, Blake. 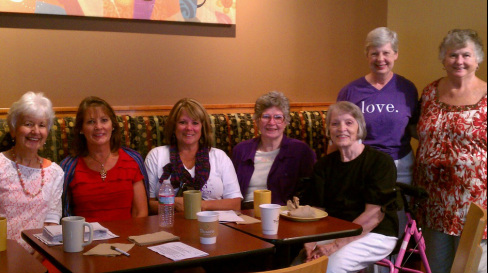 August Coffee Group at Paneras. 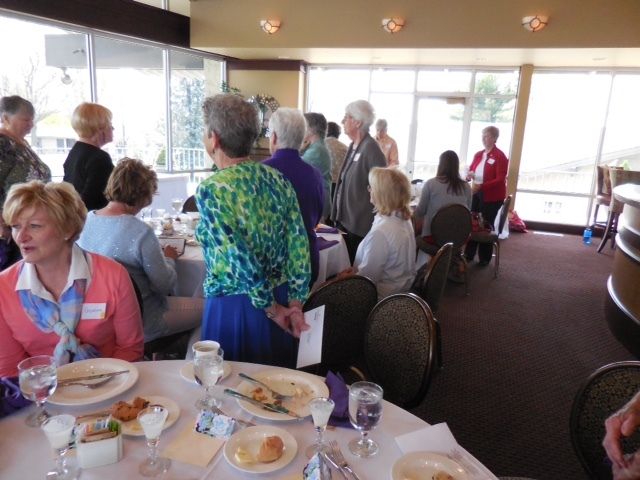 Carolyn Granger Austin, N; Melinda Dunard Horn, N; Vicki Wellman Bird, N, Brenda Riley Smith, N; Jonna McKendrick Merritt, N; Barbara Smith Thompson, N. Also present, Sharon Heil Telgemeier, N; and Carol Crank Phillips, N.
Melinda Dunnard Horn, Nu, presenting out shield at the convention. Melinda was our delegate--the first time we've had one. 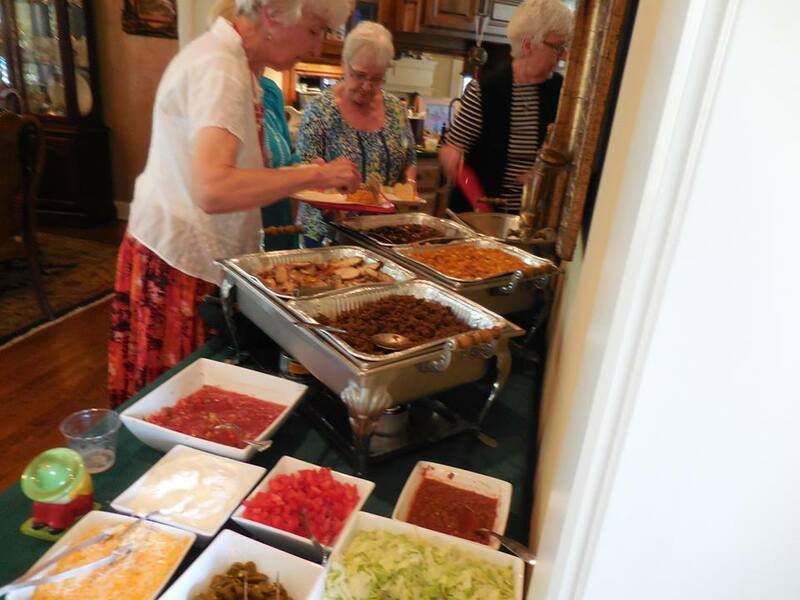 Barbara Smith Thompson, N; Donna Jones Clark, N; Frankie Ritter Wainwright, K; Carol Crank Phillips, N; Carolyn Granger Austin, N; and Carol Ruf Gurley, N.
Twenty-five women from seven different collegiate chapters met at the original Waldo Pizza to welcome new alums to alumnae life. New Graduates Emma Hecht, Eta Chi; Shelby Wittmeyer, Mu, and Kelli Ourada, Stephanie Burns, and Amanda Ready, Zeta Tau, attended. 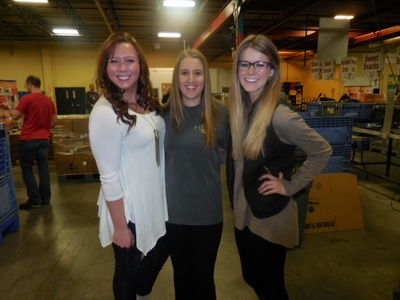 In addition to the new grads, Jaime Kern Keltner, Alpha Gamma, Mary Ann Gibson Simmons, Nu, and Jessica Zuke, Mu, were first-time attendees. Vicki Wellman Bird won 1/2 of the $68 in the 50/50 drawing, the Foundation receiving the other half. (That makes a total of $168 given to the Foundation this fiscal year.) Door prizes were won by Emma Hecht, Linsay Spiek, Zeta Tau, and Rhonda Trosen, Mu. See photos below. 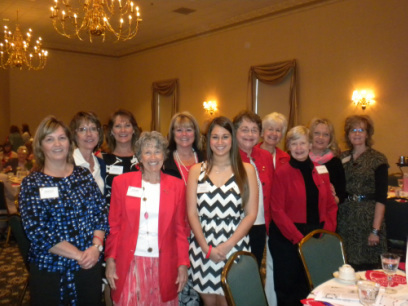 Eleven alumnae and one collegian, along with her mother, enjoyed the GKC Panhellenic Silent Auction and Brunch. Vicki Bird was the WOY for Tri Sigma. 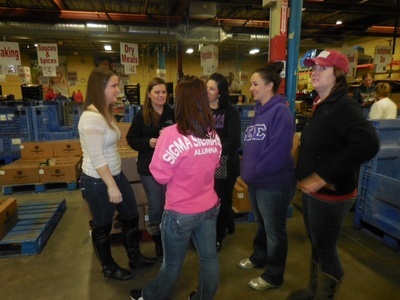 Two Tri Sigma collegians were awarded scholarships, Lindsey Grindel from UCM and Sarah Trosen from Truman State. 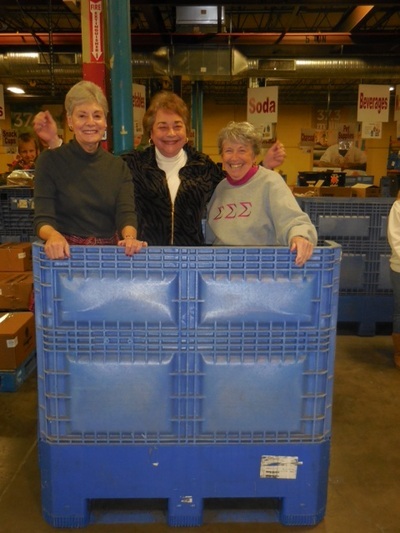 Several local Sigmas contributed items for the auction: Terry Strobel Jackson, Nu, Darla Peck, Nu, Lea Ann Rice Sprague, Nu, and Carol Gurley, Nu. Photo: Rhonda Allen Trosen, Mu, Brenda Merryfield, Nu, Melinda Dunard Horn, Nu, Carol Crank Phillips, Nu, Vicki Wellman Bird, Nu, Lindsey Grindel, Nu, Carol Ruf Gurley, Nu, Carolyn Granger Austin, Nu, Frankie Ritter Wainwright, Kappa, Cathy Angotti Althaus, Nu, Susan Sedge Brand, Nu. 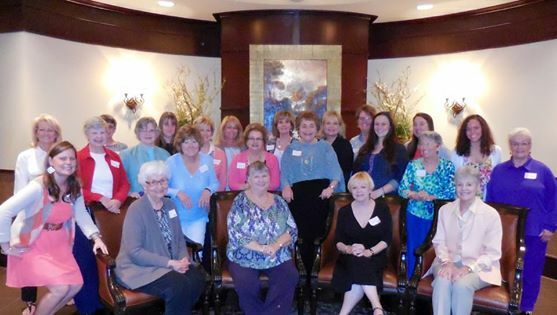 Back row: Donna Jones Clark, Nu, Lucy Kirby Brewer, Nu, Carol Crank Phillips, Nu, Rosalie Cowdrey Karczewski, Nu, Judy Jones Wells, Nu; Front row: Frankie Ritter Wainwright, Kappa, Barbara Smith Thompson, Nu, Carole Ruf Gurley, Nu, Brenda Riley Smith, Nu. Back row: Claire Muraski, Mu; Donna Jones Clark, Nu; Bethany Williams, Mu; Shelby Wittmeyer, Mu; Sydney Wittmeyer, Mu; Spencer Wittmeyer, Mu; Ronda Potter Brown, Nu; Leigh Ann Lemery-Hall, Nu; Rosalie Cowdrey Karczewski, Nu; Janis Edmon, Nu; Middle row: Amanda Trosen, Mu; Elizabeth Shelton Hamilton, Nu; Leaetta Ormsbee Templeton, Nu; Front row: Brenda Riley Smith, Nu; Frankie Ritter Wainwright, Kappa; Carol Crank Phillips, Nu; Sarah Trosen, Mu; guest; Jonni Wainwright Allen, guest; Rhonda Allen Trosen, Mu; Kim Sage Benson, Mu; Ashley Brennan Adorante, Alpha Gamma, Addie Benson, guest. 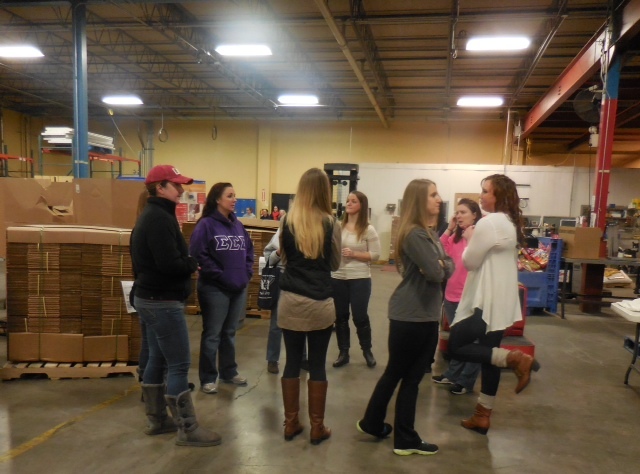 Twenty-three collegians and alumnae made boxes, packed apples and cleaned up our area at Harvesters. 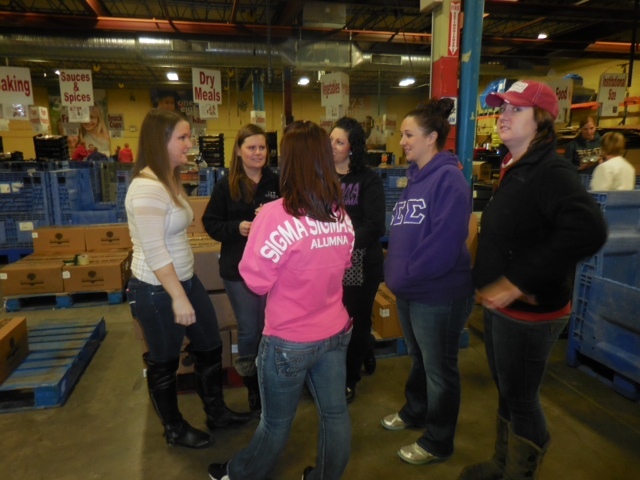 It was great to have six collegians from Truman State join us for this annual event. We also brought 50 lbs. 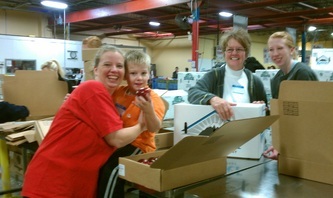 of food donations and gave a $25 check. 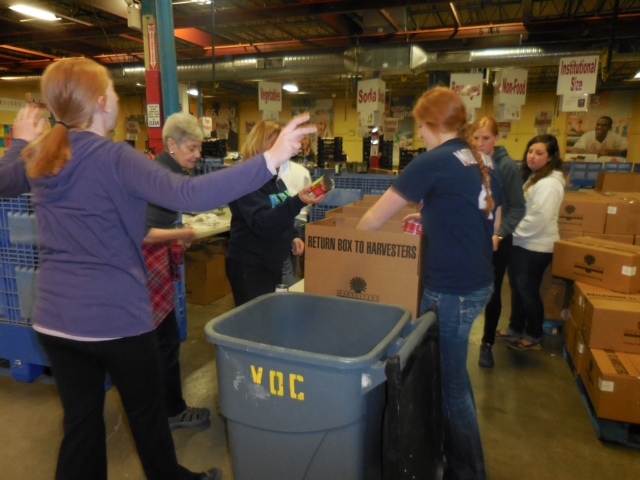 Harvester's figures 39 meals provided with 50 lbs of food. 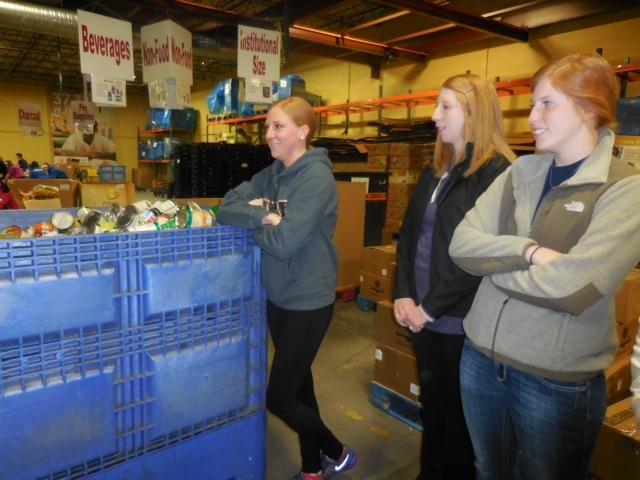 We watched a video which gave us a lot on info about the organization and then we toured the facility. Photos of the group in action. 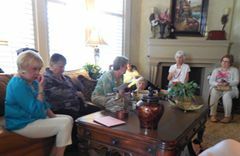 Carol Crank Phillips, Nu, Barbara Smith Thompson, Nu, Donna Jones Clark, Nu, Carole Ruf Gurley, Nu, Carolyn Granger Austin, Nu. Sydney Whittemeyer, Mu, giving a clue to her team, Brenda Riley Smith, Nu, Carolyn Granger Austi;n, Nu, and Rhonda Allen Trosen, Mu.